A lieutenant colonel of 160 Territorial Army was injured in gunfight in Manigah forests of Kupwara district today. Lt Col KS Natt was injured when militants opened indiscriminate fire in the forest area where Commanding Officer of Army’s elite unit Col Santosh Mahadik was killed in a gunfight five days ago. 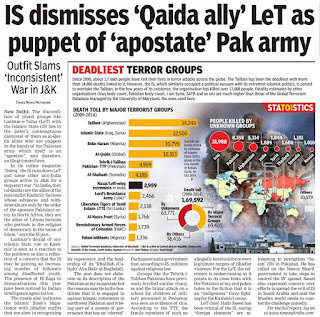 “One of our officers has been injured in the gunfight and the operation to flush out militants is under way,” Army spokesman Col NN Joshi said. “The injured officer has been removed to the Kupwara military hospital,” he said. Sources said Lt Col KS Natt was heading a small team of Army men to comb the area at the time of the incident. “The officer was hit on the jaw,” sources said. Poor visibility and tough terrain hampered the operations in the dense area forest area, they said. A combing operation has been going on for the past 10 days in Haihama, Kupwara, around 120 km from here, which is being jointly carried out by the Army, police and Special Forces. The security forces have been combing more than 3 sq km forest area since November 13 to flush out a heavily armed group of three-to-five Lashkar-e-Toiba militants, who are hiding in the area. The group of militants is believed to have infiltrated around three weeks ago and was intercepted by the Army in the second tier of the counter-infiltration (CI) grid. One member of the militant group had died, allegedly due to hypothermia, and his body was found near the Kumkadi forest area, close to the Line of Control (LoC). An assault rifle and a wireless set were found near the militant’s body. Since the operation began, there have been four brief encounters with the hiding militants so far—the last being this afternoon. The militants have each time managed to flee after brief gunfights. A colonel has been killed; a lieutenant colonel and four soldiers have been injured in the operation so far. Another massive combing operation has been launched in neighbouring Handwara forest in the same district. A brief gunfight took place in the area yesterday. The combing operation was under way in Bawan Rajwar, Handwara, 90 km from here, after a joint party of the Army and the police intercepted a group of heavily armed militants. Rejecting the government notification for implementing one rank, one pension (OROP) formula for the armed forces on the grounds that it was unfair and full of flaws, the United Front of Ex-servicemen has decided to take their battle to the Supreme Court. Revealing that they would be filing a petition before the apex court within few days, Major General Satbir Singh (retd), the front’s adviser today claimed that several top lawyers have agreed to take up their cause without charging any fee. Terming the notification a “betrayal”, he said there were seven serious flaws in the order which was contrary to the defined and accepted definition of the OROP. The formula that was devised by the Defence Minister and acceptable to the veterans was later subverted by the Ministry of Finance and the Prime Minister’s Office, he added. 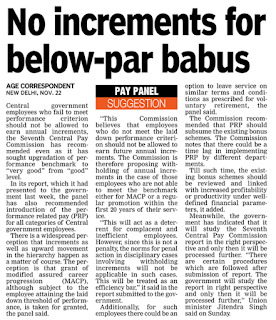 Non-inclusion of future pre-mature retirees in the ambit of OROP, revision of pension once in five years instead of every year, fixation of pension at the average of the minimum and maximum of the pay scale instead of the maximum, fixing 2013 calendar year instead of the financial year for implementation and appointing a one-man judicial commission with inclusion of stake holders to address anomalies are among the flaws in the government order, Major General Satbir said. “These flaws would lead to veterans losing one increment, seniors getting lesser pension and result in one rank many pensions,” he added. Stating that they were not agitating for money, but for ethos, dignity and equality, he said the government notification was not fair and not acceptable, and the veterans’ fight for their rights would continue. 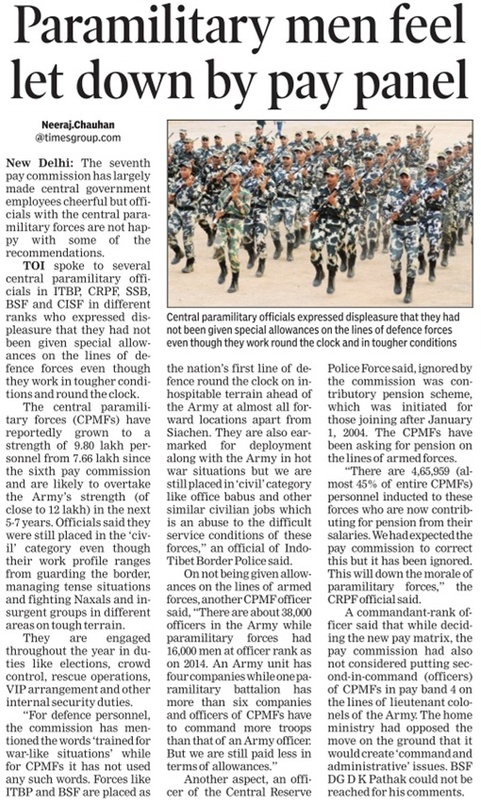 Several paramilitary forces personnel are dejected over the Seventh Central Pay Commission’s (CPC) proposals as some of their crucial demands have not been appropriately recommended. 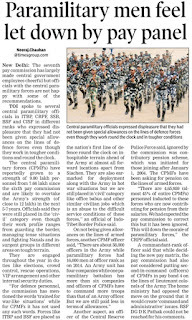 These demands are non-functional financial upgradation (NFFU), bringing the basic pay of Second-in-Command (2IC) officers on a par with the Indian Army’s Lt Col, improvement in the modified assured career progression (MACP) scheme and removal from the contributory pension scheme, wherein personnel have to contribute 10 per cent of their salary for pension accumulation. The pay panel in its report has recommended that NFFU should be extended to paramilitary and defence forces, due to the promotional stagnation in their ranks, however, two members have not supported this. NFFU ensures when an IAS officer is posted at the Centre with a specific grade pay, the officers belonging to the batches of Organised Group A Services (OGAS) that are senior by two years or more to the IAS officer, and have not reached that particular grade pay, would be granted the same grade pay on non-functional basis from the date of the posting of the IAS officer at the Centre. “We feel a sense of betrayal as clauses added by the Seventh CPC’s recommendations dilute the NFFU recommended by the Sixth CPC. 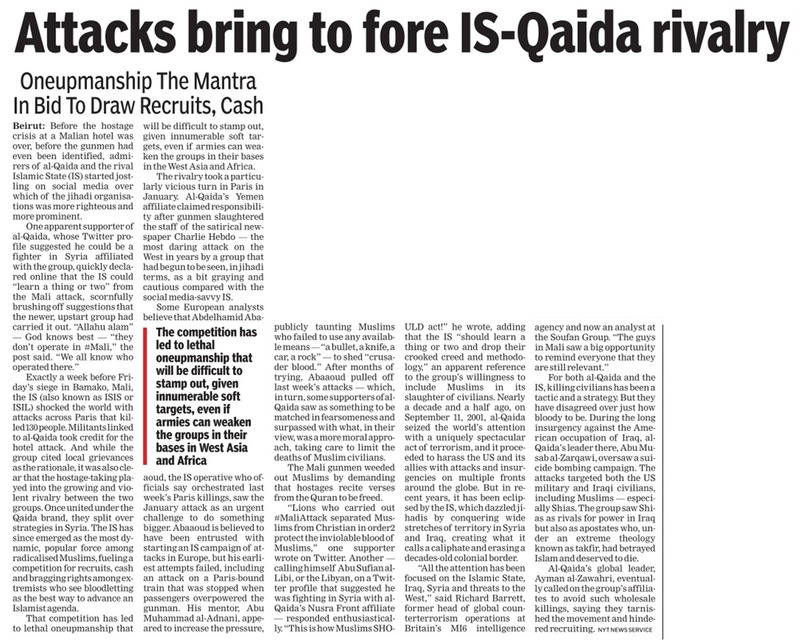 The Seventh CPC fails to understand that no time-bound promotion exists in paramilitary forces and are only vacancy based, unlike in the defence forces,” explained a paramilitary force officer. The Central Reserve Police Force, Border Security Force (BSF) and Assam Rifles had demanded that their 2IC be placed in Pay Band-4, like their counterparts, Lieutenant Colonel in the Army. The CPC has termed this demand as irrelevant. Ex-servicemen today flayed the Seventh Pay Commission’s recommendations to abolish several existing allowances and benefits that were applicable to members of the armed forces. Speaking to mediapersons, they pointed out that the Commission has recommended that the entitlement of free rations for defence officers and furlough leave be abolished. Further, the Commission has also recommended that counting Military Service Pay (MSP) for calculating house rent allowance and transfer grant be done away with. The perk of 100 free units of electricity to defence personnel as well as the funeral allowance of Rs 5,000, that had been introduced to ensure dignified last rites to ex-servicemen from the lower strata, have also been abolished. Ex-servicemen said the rates of MSP recommended by them to the government was 52 per cent of basic pay for officers and 62 per cent for other ranks, which have not been accepted. 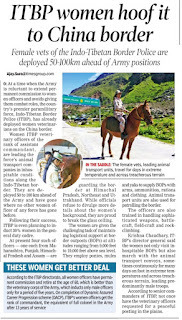 Even the Siachen allowance, the highest for hardship, _has been capped at Rs 31,500, whereas a civilian officer of the rank of joint secretary, when posted _to cities in Ladakh or _the northeast will get 30 per cent of basic pay, which works out to Rs 54,810 per month. Ex-servicemen urged the three service chiefs to take up the issues strongly with the government and ensure that the armed forces are not harmed or degraded. The Armed Forces Tribunal (AFT), New Delhi, has issued notices to the Army authorities in Jammu and Kashmir after six convicts in the Machil fake encounter case challanged the verdict of the Summary General Court Martial (SGCM), which awarded life imprisonment to them. The General Officer Commanding-in-Chief, Northern Command, had in September confirmed life imprisonment awarded to Colonel Dinesh Pathania, Captain Upendra, Havildar Devendra Kumar, Lance Naik Lakhmi, Lance Naik Arun Kumar and Rifleman Abbas Hussain. The six have been convicted for the killing of three youths in a staged encounter in the Machil sector of frontier Kupwara district on the night of April 29, 2010. After the SGCM verdict, the six convicts approached the AFT, New Delhi, challenging the verdict. All of them moved separate appeals before the tribunal. The convicts challanged the order of the SGCM on many scores like being arbitrary and against facts and figures. The AFT will scrutinise the order of the SGCM. Five of the convicts are lodged in jail in their respective hometowns. Territorial Army man Abbas is lodged in jail in Jammu. Notices have been issued to the General Officer Commanding of the Srinagar-based 15 Corps, Kupwara-based General Officer Commanding of the 28 Infantry Division and many top Army officers in the state by the AFT. Riyaz Ahmad, Muhammad Shafi and Shahzad Ahmad of Nadihal-Rafiabad in Baramulla were lured by former Special Police Officer Bashir Ahmad Lone and his accomplice Abdul Hameed on the pretext of getting them high-paying jobs and later handed over to the Army for Rs 50,000 each. The Tribune was the first to publish the story on November 13, 2014, that the SGCM convicted its men for killing three civilians in a staged encounter along the Line of Control in the Machil sector in 2010 and were later branded as foreign militants. NEW DELHI: The armed forces are livid at the 7th Central Pay Commission (CPC) for questioning the jump in disability pension cases, especially in senior ranks, after the last pay panel substantially hiked the payout for them. Several serving and retired officers on Saturday contended the pay panel had relied upon "one-sided data" provided by the controller general of defence accounts (CGDA) to arrive at "an erroneous conclusion". While admitting there may be "a few aberrations", the entire disabled soldier community cannot be tarnished with the same brush, they said. This comes a day after TOI reported the 7th CPC has sought abolition of the "percentage based" disability pension regime since there was "an upward trend in personnel superannuating with disability element at senior levels", while the converse was true for jawans and JCOs. Instead, the more equitable "slab based" system should be restored, it held. The 7th CPC insinuates disability pension provisions are being misused. But how can disabilities, medical records and boards be faked? 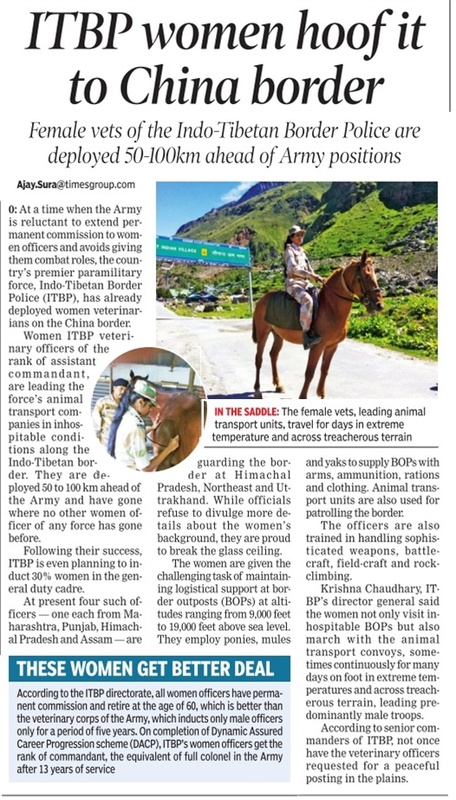 Many officers and jawans do get injured in operations or suffer disabilities serving in high-altitude areas like Siachen or Kargil," said a senior officer. Major Navdeep Singh (retd), a practising high court lawyer, in turn, said, "Rather than imputing misuse of provisions, the system should be concerned with the rising disabilities and stress levels in the military." Holding that it was well-documented that life expectancy of military personnel is lower than their civilian counterparts, he said it was this aspect that required attention rather than "twisting" the entire issue. 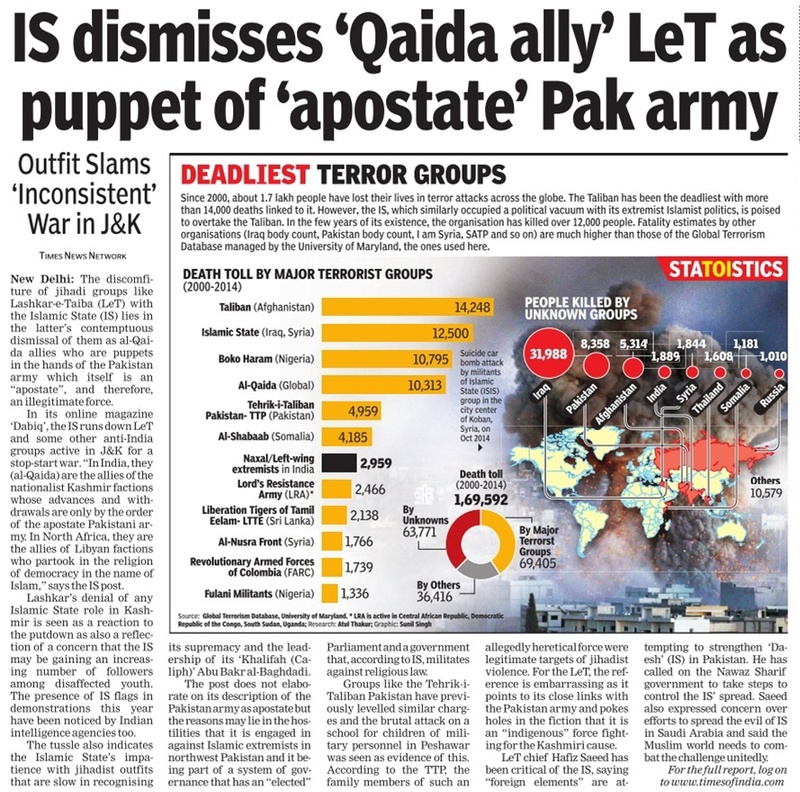 "The 7th CPC data seems faulty and one-sided without verification from the defence services. Many of such cases would be those who were illegally denied disability benefits earlier, but are getting them now on court orders or due to change in government policy. The system of slabs/flat rates of disability pension cannot be introduced in the defence services alone unless the same is also done on the civil side. 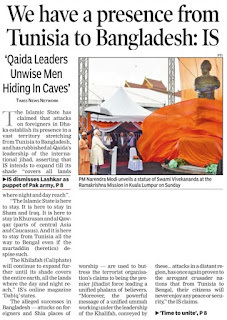 This is a regressive recommendation," added Major Singh. Another reason that disability pension claims went up after the implementation of 6th CPC was due to the substantial hike in the compensation. For 100% disability, for instance, it went up from Rs 1,550 to Rs 3,138 for jawans and from Rs 2,600 to Rs 27,000 for officers. "Many eligible personnel did not opt for disability pension earlier since there were lot of hurdles and red-tape involved. 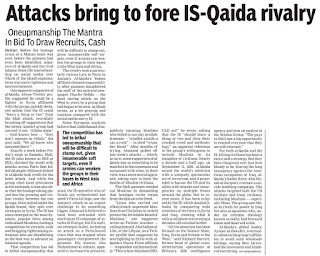 But after the compensation increased, personnel with disability began to claim their legal right," said a brigadier. NEW DELHI: Officers of the three defence services — Army, IAF and Navy — are paid 29% higher salary compared to their civilian counterparts from the IAS, IPS and other Group A services at the starting level, the seventh pay panel has said. 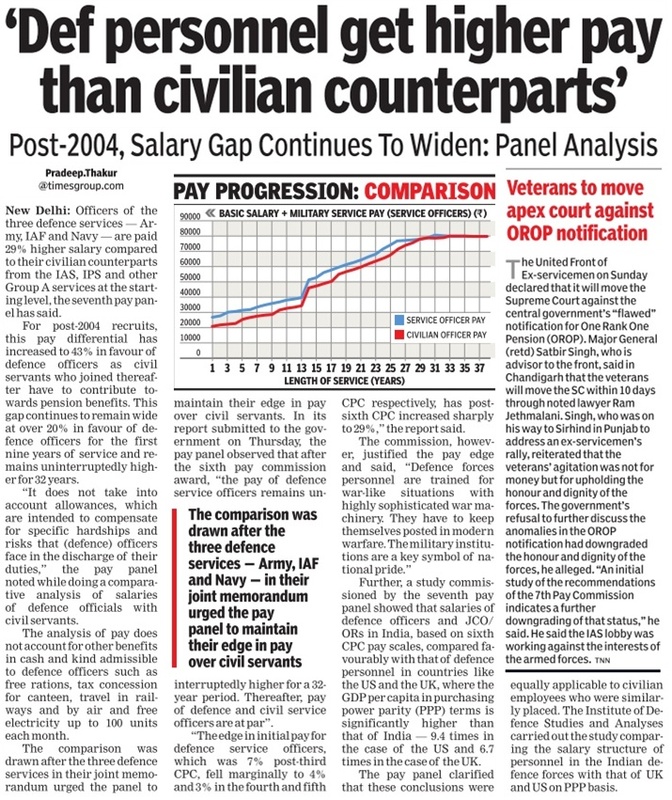 For post-2004 recruits, this pay differential has increased to 43% in favour of defence officers as civil servants who joined thereafter have to contribute towards pension benefits. This gap continues to remain wide at over 20% in favour of defence officers for the first nine years of service and remains uninterruptedly higher for 32 years. "It does not take into account allowances, which are intended to compensate for specific hardships and risks that (defence) officers face in the discharge of their duties," the pay panel noted while doing a comparative analysis of salaries of defence officials with civil servants. The analysis of pay does not account for other benefits in cash and kind admissible to defence officers such as free rations, tax concession for canteen, travel in railways and by air and free electricity up to 100 units each month. The comparison was drawn after the three defence services in their joint memorandum urged the panel to maintain their edge in pay over civil servants. 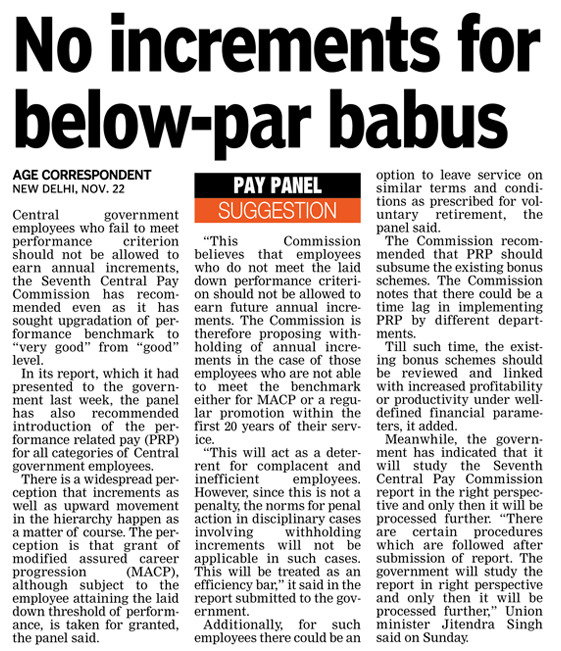 In its report submitted to the government on Thursday, the pay panel observed that after the sixth pay commission award, "the pay of defence service officers remains uninterruptedly higher for a 32-year period. Thereafter, pay of defence and civil service officers are at par". 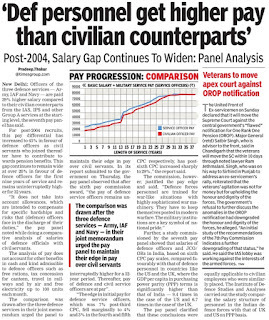 "The edge in initial pay for defence service officers, which was 7% post-third CPC, fell marginally to 4% and 3% in the fourth and fifth CPC respectively, has postsixth CPC increased sharply to 29%," the report said. The commission, however, justified the pay edge and said, "Defence forces personnel are trained for war-like situations with highly sophisticated war machinery. They have to keep themselves posted in modern warfare. The military institutions are a key symbol of national pride." Further, a study commissioned by the seventh pay panel showed that salaries of defence officers and JCO/ORs in India, based on sixth CPC pay scales, compared favourably with that of defence personnel in countries like the US and the UK, where the GDP per capita in purchasing power parity (PPP) terms is significantly higher than that of India — 9.4 times in the case of the US and 6.7 times in the case of the UK. The pay panel clarified that these conclusions were equally applicable to civilian employees who were similarly placed. The Institute of Defence Studies and Analyses carried out the study comparing the salary structure of personnel in the Indian defence forces with that of UK and US on PPP basis.